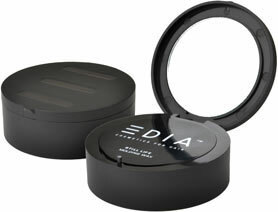 EDIA (pronounced E-D-A) cosmetics: simple solutions for on-the-go chic. Using technological advancements to keep beauty mobile, EDIA offers hair products for the time conscious, yet style savvy consumer. The EDIA design empowers by providing fresh and uniquely portable products for crafting individual, versatile looks. EDIA's foundation brings together the Fashion Session Stylist and Industrial Design worlds when creating our packaging, products and core concepts. EDIA products are aimed at the environmentally aware customer with a modern sensibility, each formulation drawing from decades of professional stylist experience. With EDIA's functional approach to style, fine retailers, select salons, and their clientele are offered innovative options to move beauty forward. © EDIA COSMETICS. ALL RIGHTS RESERVED.